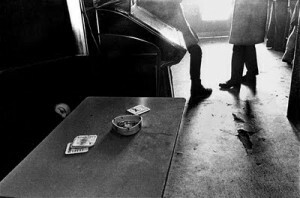 Thanks to all who have contributed to the discussion on Anders Petersen’s ‘Cafe Lehmitz’. It has been a really busy month! We have compiled an archive of the posts below for future reference and will also be listed under the reading list page. Our thanks to Aya Takada fro producing this text on Anders Petersen’s Cafe Lehmitz which is featured here in both a Japanese and English translation. As well as checking out her website, you can follow Aya Takada on Twitter. It is in the photo exhibition “Rat Hall Gallery” in Tokyo in 2007 that I first met Cafe Lehmitz. The first impression I saw reminded me of the book jacket from ‘Weegee’s people’, the production and typography were splendid. However it is the latest Cafe Lehmitz by Schirmer/Mosel that exists in my hands now. If the book is opened, it is possible to put your own body to Cafe Lehmitz. There are times when you hear that kind of opinion, but on the other hand, it is through a young photographers eyes that this very pure and straight style could emerge. It seems like a conventional approach was chosen, simple and lacking in sensational images with a rustic feel. 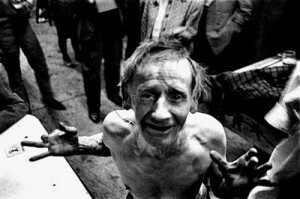 The work is not dissimilar to that of Daido Moriyama in this respect. with each passing page, the subjects seems gradually to release themselves to Petersen. I feel a deep affection for the subject from the photographer. I feel a line of vision near the sense that parents watch the child in a word to which family’s photo album is concluded. This will be able to be seen from the portrait of the photographer in the back book cover. The family is indispensable for Cafe Lehmitz. You might also understand the reason why this book keeps being resold as many as ten times, and being loved well. 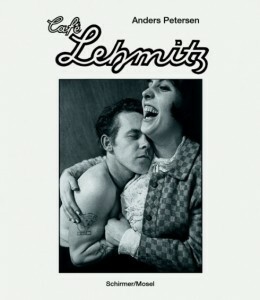 Cafe Lehmitz is one book that a young photographer must see. 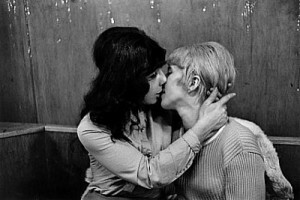 Our thanks to Aggie Morganti for getting in touch to share a love of Anders Petersen’s ‘Cafe Lehmitz’. If anyone wants to continue the conversation with Aggie, you can do so on Twitter, here. I’ve often wondered what makes Cafe Lehmitz so special to me. It’s not only about its exquisite photography, its visual intensity, its emotive tension running through the edit. That special something is, somehow, a step backwards, hiding in the making itself rather than in the final object. I am amazed every time I flip through it by its unique way of being so rich and so poor at the same time. It is rich in all the above mentioned, and poor in pretentiousness. Straightforward, down to earth, honest-to-God report of what had to be reported – and nothing else. The book itself is stripped down to the bare essentials and it only makes me love the fancy title lettering even more, so much that I almost see it blinking on and off as a neon light from a bar would do in the dark of night. It’s so transparent you can see through it – or feel you’re there. And the reason why I love it so much is that I have a very personal photographic memory related to Cafe Lehmitz (I’ll be brief – promise). So, I was around 20 and I had just started to discovery what you could do with documentary photography in terms of storytelling and powerful narratives. It was a gloomy afternoon in December, in Lucca, and I was attending photojournalist Massimo Mastrorillo’s workshop on such matters. To provide us with guidance and advice, he had brought some of his favourite photobooks with him (and many of them would also become a pick of my favourites later on, such as Billingham’s Ray’s a Laugh or Telex Iran by Gilles Peress). The table was literally flooded with wonderful things, and I remember this little, black and white white compact book striking me straight on. Cafe Lehmitz was special to him as well, for Massimo’s main advice to us was to follow what really means to us in our photography. To follow what literally grabs your heart and your stomach and does not let you go, to photograph what you love, in any possible way. So, as I have tweeted before – this is what I’ve always found in Cafe Lehmitz from that moment on. Love, warmth of heart, being human, humble and true. That’s what I like about it and what I think of every time I start doing something photographic. mixture of sailors and dock workers, strippers, prostitutes and their pimps, along with poets and small time criminals; all of whom occupy the fringe of society, and signalling the beginning of a project that would occupy him on and off for the next two years. integrated himself into the Café Lehmitz family, with it becoming a new home. I should have first seen Cafe Lehmitz back at university when my tutor suggest I see Petersen’s view of a single beer house in Hamburg for inspiration. I have to confess i didn’t see it then (sorry Jonathan!) as I was quickly distracted by the bright lights, ball parks and endless roads of American photography. And so my first viewing of ‘Lehmitz’ was only a month ago. The raw power of the striking, rich-black images grabbed me straight away, but it was the refreshingly honest and simple premise of the story that most appealed. I loved the idea I was seeing someone who first came as a visitor and soon became embraced by the seemingly dysfunctional family he depicted. 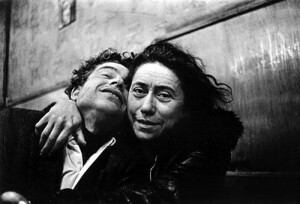 I would never had made the images Petersen made here, and I don’t know many photographers who would have. The technical skill can be taught, but the way he went about gaining trust, meeting people and producing this ‘family album’ is something only Petersen knows. photography section, I came across this book full of raw and gritty black-and-white images that bought to mind the work of Japanese photographer Daido Moriyama, an artist I had only just discovered and whose work I had fallen in love with. At that point I had never heard of Anders Petersen, was he an immensely important artist or a complete unknown, these where questions I would ask later, searching out the answers. 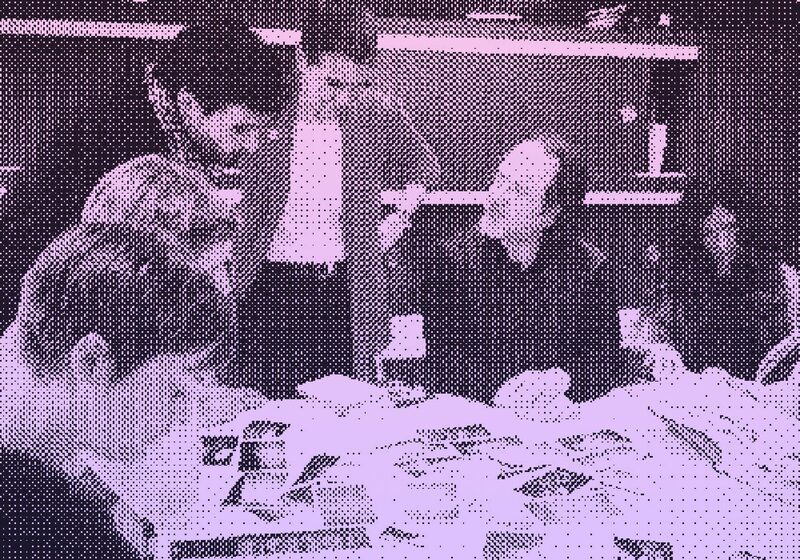 But what I did know then, as I held the book in my hands, was that he was important to me famous or not, in his work I found an energy that I had rarely encountered before, and energy that I immediately found a connection with. 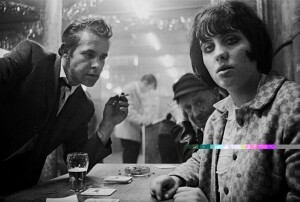 Cafe Lehmitz, a beer joint at the Reeperbahn, was a meeting point for many who worked in Hamburg’s red-light district: prostitutes, pimps, transvestites, workers, and petty criminals. Anders Petersen was 18 years old when he first visited Hamburg in 1962, chanced upon Cafe Lehmitz, and established friends that made an impact on his life.In 1968 he returned to Lehmitz, found new regulars , renewed contact and began to take pictures. His photographs, which we first published in book form in 1978, have become classics of their genre. prevents voyeurism or false pity arising vis-Ã -vis a milieu generally referred to as asocial. The other world of Cafe Lehmitz, which no longer exists in this form, becomes visible as a lively community with its own self-image and dignity. In July we will be looking at Anders Petersen’s ‘Cafe Lehmitz’ and so as a little teaser here is Anders talking about his work with the Photographers Gallery on ‘Soho Projects’. Anders Petersen has been working in London’s Soho for several weeks, as part of his Soho Projects residency commissioned by The Photographers’ Gallery. Immersing himself in its bars, cafes, homes and hotels – creating a very personal portrait of one of city’s most vibrant areas. Anders Petersen (b.1944), one of Sweden’s most noted photographers, is known for his influential, intimate and personal documentary-style black-and-white photography. 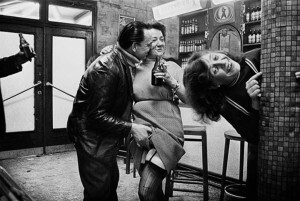 In July, The Photo Book Club will be looking at Anders Petersen’s ‘Cafe Lehmitz’ in which Peterson photographed the frequenters of the beer hall ‘Cafe Lehmitz’ in Hamburg. The book is easy to get hold of in it’s latest incarnation from Schirmer as well as other editions available in varying rarity. An Amazon UK link to the book can be found here. An Amazon US link can be found here. 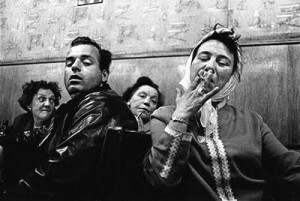 We will be looking at Ken Schles’ seminal book ‘Invisible City’ with the photographer himself taking part. So get any questions in to us so we can put them to Ken.